Purpose: There is a constant need to investigate the importance of entrepreneurship education for economic development. This paper aims for examining the potential role of entrepreneurship education in achieving Millennium Development Goals ( MDGs). Design/Methodology: The paper depends on literature review to investigate the importance of entrepreneurship education for achieving MDGs. For this purpose, some successful cases of entrepreneurship education and experience of some countries with entrepreneurship education are presented. In addition, overview of Sudanese economic performance and MDGs status for the period (2000-2010) is introduced. Findings: It is found that the importance of entrepreneurship education is well documented in the literature and its possible role in achieving MDGs is well recognized. 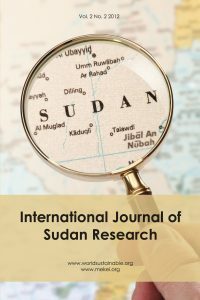 Moreover, it is found that good economic performance and some progress in MDGs status in Sudan was achieved during the period of study. Furthermore, it is found that entrepreneurship education does not exist at basic and secondary school levels in Sudan and is very limited at university level. Original: This paper links between two important issues entrepreneurship education and MDGs. By doing so, it links two different subjects economics and management. Therefore, it encourages multi-disciplinary studies.